Hello from Fleet & District Beekeepers Association (FBKA), the beekeeping association that covers NE Hampshire – roughly the areas of Hart and Rushmoor. Many of you may have noticed the new fencing that has sprung up on the other side of the car park from the Allotments – this is FBKA’s newest Members Apiary. We are very pleased to be here – despite originating in Fleet 100 years ago, the association has member apiaries in Aldershot and Farnborough but didn’t have one in Fleet! So what is a “member apiary”? 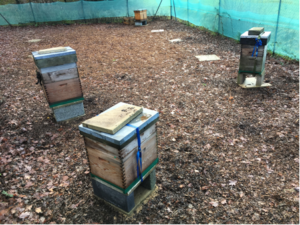 Many of our members need a place to keep their hives, as our often small gardens aren’t always suitable – so the association arranges for sites around the area where members can keep a few hives. A member apiary site is managed by an FBKA point of contact (me in this case) who reports to the FBKA Exec committee, and ensures that anyone keeping bees on the site is a suitably trained beekeeper, a member of FBKA, and follows the agreed apiary rules. 2019 will be the site’s first full year, and it’s going to be really interesting to see how the honey bees get on; on paper it should be a good location with the nearby gardens, allotments and SANG land – honeybees often do best in suburban and semi-rural areas where there’s a mix of dense planting and natural parkland areas – with a good variety of bee-friendly plants. There are spaces for up to 10 colonies on the Church Crookham site and the astute among you will have noticed 5 colonies have taken up residence for the winter. Most bees and wasps hibernate during the colder months. In many species, only the queen survives the winter, emerging in spring to reestablish a colony. But honey bees remain active all winter long, despite the cold temperatures and lack of flowers on which to forage. They do it by huddling together as a cluster to keep warm, in particular protecting the queen – in the winter a hive will be about 8-13,000 bees keeping their cluster temperature at 20-21C, so as warm as your house (this rises to 32C once breeding starts). It takes a lot of energy to keep warm, and they use their own “larder” to feed themselves in the form of honey. If their stores start to run low you might see one of us down at the apiary with bags of sugar or fondant to give them a helping hand. Let’s hope the winter isn’t too long and they all survive, because the advantage for us and the bees is that they exit winter as an already fully operational colony – and are quickly available in large numbers to help pollinate early crops and other flora. I’ll provide further updates on beekeeper, and the bees, activities at the CC apiary as the year progresses. The Fleet & District Beekeeping Association (FBKA) was founded in 1918 to support beekeepers across North Hampshire and 100 years on we welcome new members wanting to learn this fascinating and ancient skill. We encourage, train and support local beekeepers to maintain healthy, docile and productive honey bees as well as advancing the education of the public in the importance of bees in the environment.